A heat wave sizzling across the West showed little sign of letting up Thursday, with Las Vegas forecast to tie a record high and even northern Idaho expected to top 100 degrees. "You can become dehydrated really quick before you know it. You step outside and, 'wow,'" said Charlie Schlott, a meteorologist with the National Weather Service in Las Vegas. "Like an oven, it's really hot," Ashley Lowe, a manager of a Denny's restaurant in Las Vegas, told CBS Radio News' Mara Rubin. "We could fry eggs on the sidewalk." Firefighters in Tempe, Arizona, know how to deal with the heat, says Senior Fire Inspector Mike Reichling, and try to help others do so, too. "We really try to educate our public as to what they need to do as far as hydration, wearing the right clothing, wearing a hat, doing all those things early before the event to where they can survive and be healthy during these times," Reichling said on CBS News' The Early Show. "We drink a lot of water, we wear dark colors, because dark colors absorb the heat and keep us cooler," Lowe said. "It will be just as hot again today, with the 100-degree heat stretching across California, as well as parts of Oregon, Washington and Idaho," says CBS News meteorologist George Cullen. 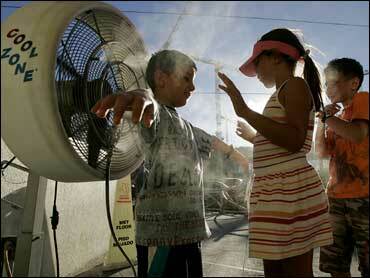 Las Vegas was expected to hit 116, which would tie a record for the date set in 1985. Near-record highs were also forecast for Southern California, where the mercury was expected to top 115 in desert. Los Angeles is on track to record the driest 12 months since records began back in 1877, reports CBS News correspondent Sandra Hughes. A high of 101 was forecast Thursday in Spokane, Wash., and nearby Coeur d'Alene, Idaho, which would exceed the record of 100 set in 1975. Friday's forecast didn't hold much relief from the nearly weeklong heat wave, either. In California, Gov. Arnold Schwarzenegger ordered the opening of state cooling centers in 13 counties, and the operator of the statewide power grid ask Californians to try to conserve energy to avoid brownouts. Tempe's firefighters ride around the city, helping the public. "We have a tool called the 'Sea Breeze,' that actually puts out an atomized mist of ice-cold air that can drop your body temperature about 4 degrees, and that will assist your body in lowering your temperature to normal ranges," medical transport coordinator and firefighter John Valenzuela told Early Show co-anchor Harry Smith. Across the Southwest and Southeast, extreme drought conditions have fed fires like the Neola blaze, already burning 62 square miles near Salt Lake City and killing three people, reports Hughes. Officials now say it may burn all summer. Three firefighters suffered heat exhaustion while battling a 700-acre wildfire that broke out Wednesday northwest of Santa Barbara, said Santa Barbara County Fire Capt. Craig Vanderzwaag. Moisture levels in some of the largest logs east of the Cascade Range have dropped to what typically is seen in the hottest days of August, U.S. Forest Service officials said. "We're headed toward a long, hard fire season, the way it looks. The public needs to be prepared for it," said Steve Rawlings, fire management officer for the Colville National Forest in Washington. "We've slid into fire season without people making a big issue about it." Across the country, officials just this week declared the entire state of Alabama a drought disaster area. "With the drought going on the way that it is, we encourage you to stay away from any brush, forest areas, things of that nature," said C.W. Mardis of the Birmingham Fire Department.